Forever’s classically pure aloe vera gel. This is the standard by which all others are judged. 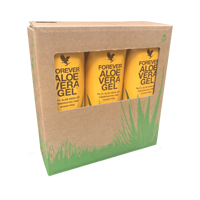 Our Forever Aloe Vera Gel is made of 99.7% pure inner leaf aloe vera gel to help support your digestive system and assist in nutrient absorption. Stabilized Aloe vera gel [Aloe vera gel (99,7%), vitamin C (ascorbic acid), antioxidant (ascorbic acid), acidity regulator (citric acid)].